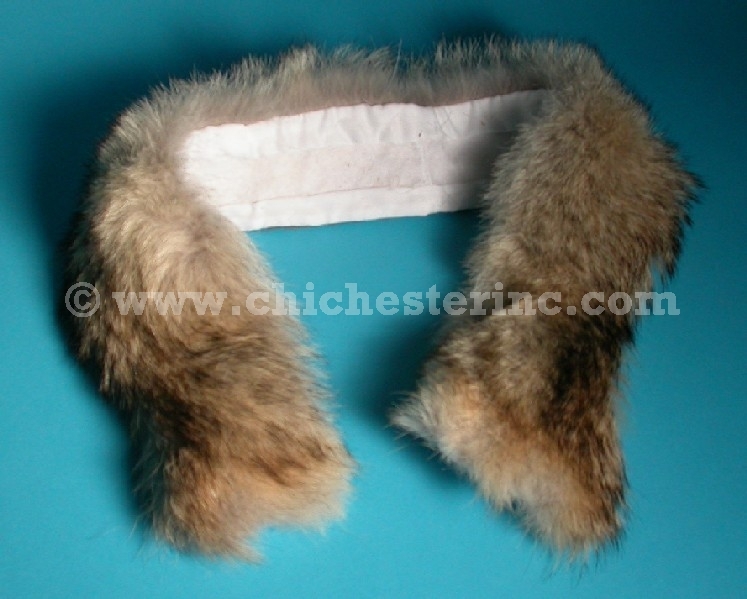 We can provide finished parka collars out of coyote fur that you can sew into your parka hood. The collar is prepared by a furrier and is made so that the fur runs down from the neck on both sides. We work with contractors in Canada who can produce large quantities. Call or write for volume pricing. To replace the fur collar on a N-2B USAF jacket, you will need two pieces that are 2" by 16". We make these with a sage green backing to make it easy for a seamstress to sew the collar into your jacket without the backing showing. Other sizes available on a customer-order basis. NOTE: We can also provide parka collars and cuffs out of different fur types. Prices will vary accordingly. See examples below. We made a 24" x 4" Arctic fox fur trim piece with a backing for a customer. The price is US$30 for the sewing charge and US$150 for the Arctic fox fur.